Showers early, then cloudy overnight. Low 48F. Winds NW at 5 to 10 mph. Chance of rain 30%..
Showers early, then cloudy overnight. Low 48F. Winds NW at 5 to 10 mph. Chance of rain 30%. 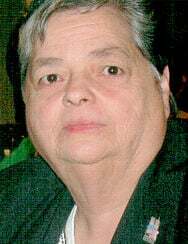 Georgianna Duprey BARRE CITY — Georgianna "Anna" Duprey, 75, of Barre. passed away Jan. 31, 2019, at the Central Vermont Medical Center in Berlin where she died from a long battle with lung cancer. She was born Oct. 6, 1943, in Barre, the daughter of the late Clifford J. and Marion (Perkins) Abare. Anna quit school at the age of 16 to care for her grandmother. Later in life, she went to Basic Adult Education and obtained her degree. In 1959, Anna married Francis Duprey, who passed away in 1982. Anna cared for her husband as he battled cancer. Her love for being a caregiver continued for her mother and many others, as well. During Anna’s life, she received several awards for her writing and volunteerism. She was especially proud of her award from the U.S. government for a story she had written. Anna was a caring and loving wife, mother and grandmother. Anna will be missed but not forgotten. Survivors include her son, William Duprey and wife Debbie, of Northfield; two grandchildren John Duprey, of Northfield, and Chrissie Jones, of Danville; two stepdaughters Penny Nalloy, of Middlebury, and Dianne Lafar, of Swanton. Besides her husband, she was predeceased by her brother, Samuel Abare; two sisters Grace Hardack and Rose Smith; two stepchildren Frances Duprey and Sandra Snide. A special thank you goes out to the many friends and family who supported her during her battle with cancer. A celebration of her life will take place on Thursday, Feb. 7, 2019, at the First Baptist Church, 24 Washington St. in Barre at 11 a.m. There will be calling hours immediately before the service at the church from 10 to 11 a.m. Spring burial will be held at a later date. There will be a potluck immediately after the service in the church basement. Arrangements are in the care of the Pruneau-Polli Funeral Home, 58 Summer St., Barre, Vermont. Those wishing to send online condolences may do so at: www.pruneaupollifuneralhome.com. Anna’s lamp is full and her light will forever burn brightly. A cherished friend, she touched our lives in countless ways. Always compassionately caring for those around her, she gave freely of herself. Never seeking recognition, she worked tirelessly to make the quality of everyone else’s lives better, even when it was a burden to hers. We are blessed to have shared life with her. Our Memories Are A Gift, Never Forgotten!